China Residencies met with Qu Yan, artist and founder of XuCun International Art Commune, in his studio in Huairou's Qiaozi Art Community to talk about the unique challenges of running an international residency in a 2,000-year-old agricultural village. China Residencies: When did the project start? How do you find about the village of Xucun in Shanxi province? Qu Yan: I cam across Xucun around 2007, it was very coincidental. I had been working on my village photography project since 2005, and I happened to find this place deep inside the Tai Hang Mountain. There are still partial remnants of the village's traditional cultural form but a lot of it was destroyed by urbanization and rennovations. Xucun is more or less just a typical village that no one pays attention to, but I came up the idea of collaborating with government to show the world its true potential. CR: When you started this project, were the artists you invited local or international? QY: The artists were acquaintances at first, and it took a little time to get it up and running because the idea of an artist village and the art residency are so new around here. 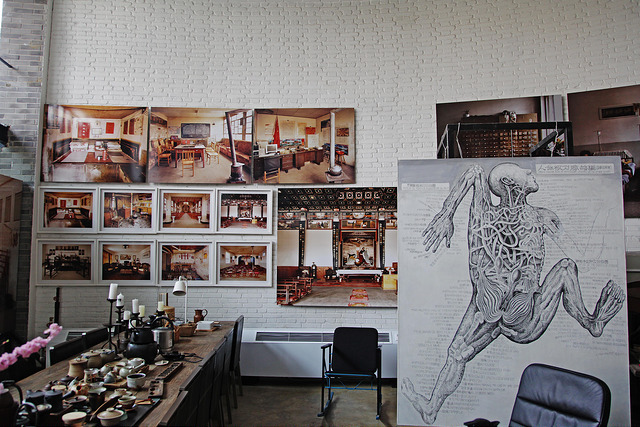 China has no roots in non-governmentally funded art foundations and nonprofit institutions. When I started this project, they had no idea what I was doing. It was a long process that took a lot of research, understanding, and explaining, for them to see the benefit. Meanwhile we had to find a public building and infrastructure for the renovation. Finally in 2011, we started the program in the only format the government would approve of: an art festival [The Heshun International Art Festival]. The residency program came out of the festival. CR: Do you run this project annually? QY: Twice a year. We plan to hold forums around the topic of Chinese villages, i.e. social transformation, villages rescuing and other incentives, when there aren’t residencies going on. We think this will be interesting because the topic isn’t something commonly discussed amongst artists. Especially when we are able to expand the perspectives of the villagers with guests from elsewhere. Two Hong Kong artists were here last year, one of them being Wu Dar-Kuen, current director of the Taipei Festival and previous director of Kuandu Museum of Fine Arts. CR: So you stay here [in Beijing] during the rest of the year? QY: Yes, I’m a practicing artist as well. I mostly work in painting and photography. A lot of my photos are of public spaces in Xucun and Shanxi: hospitals, churches, and the offices of governors in provincial areas. I teach at two colleges as well. Things can get a little hectic! CR: How did you select the artists for the 2015 summer session? 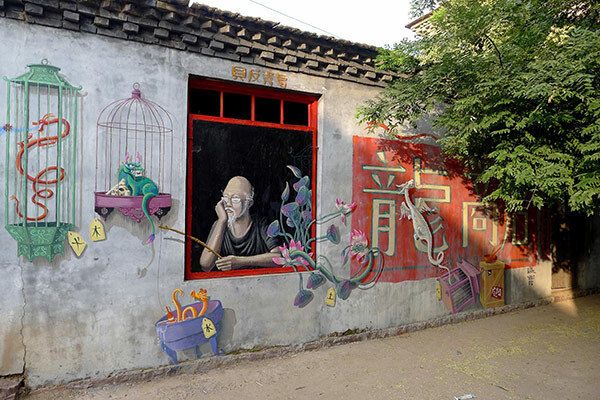 QY: We wanted to do something with graffiti because Xucun has so many dilapidated houses. We want to use art to give them some visual value. This was my first attempt in putting up graffiti in a village...we definitely have to be deliberate and careful about it. CR: Is this considered illegal, and do you foresee any legal issues? QY: In the city, maybe. 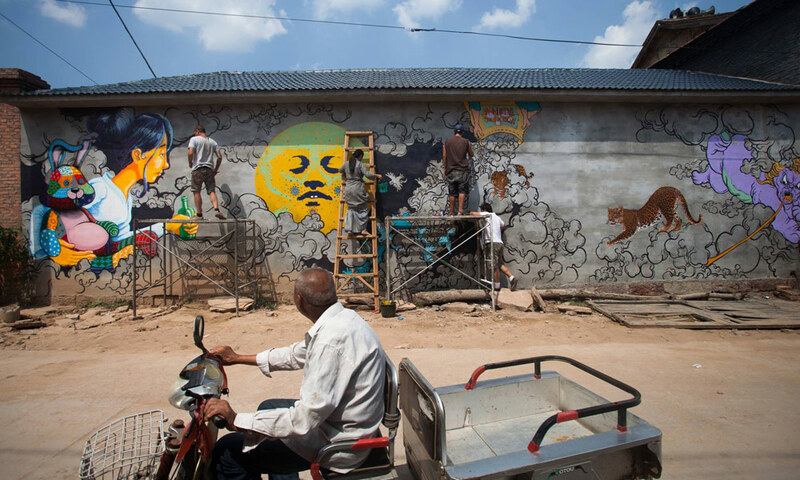 But we have a traditional history of graffiti in our culture that we call mural painting. We don’t think of it as graffiti, which is a Western concept and a product of urban culture, the industrial civilization, and landscape. Here, people have a very different relationship with their surroundings. We want to turn the idea of graffiti into something that could positively impact and beautify the environment. Even though we successfully built up trust with the government for the last festival, approval can be difficult to get. In our case, being in a village, administrators are less likely to consider the action as intending to destroy infrastructure, and more as a revitalizing tactic to improve the widespread dilapidation. We chose artists who were inspired by the village, who were interested in finding the relationships between local cultural elements, rather than just putting up some typography on the wall. That stuff is lot of arrogance but with no style. CR: Do you have plans on organizing an exhibition, or documenting the event in any other way? QY: TV journalists come every year to interview us so promotion isn’t really a problem because it’s pretty attention-grabbing. CR: They must be interested in what you do! You built some studios here too -- are you planning for artists to live here for the rest of the year? QY: Not yet, it’s currently still pretty inconvenient because of the transportation renovation that’s going on. We’re looking to expand the timeframe of the residency starting in this year, though it won’t extend into the winter. 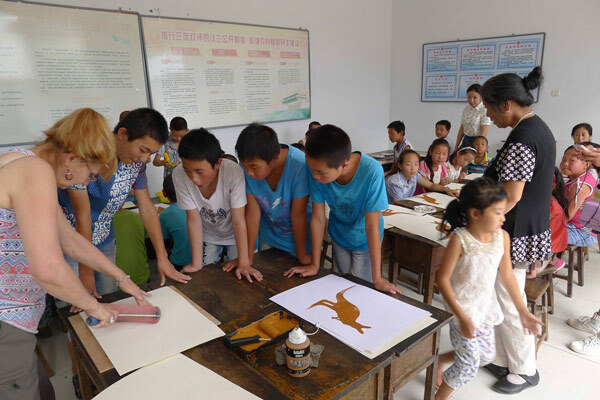 Last year the Australia China Art Foundation, which is founded by a Chinese Australian and operates several program throughout China, started children's art education programs here. CR: How do you think your project will impact the village? What do people think about the program? QY: It definitely has had an impact, but at kind of a slow pace. We’re not doing it anticipating for it to have a huge impact, which sometimes can have a negative effect. The villages in China nowadays are very practical -- money is prioritized over ethics and beliefs. Xucun is a good example of this change, being an area from where a lot of Han culture originated. Through time’s transformations, traditions are lost. New commercial projects that came from the first year of the project made the village more lively, and people felt the benefit. In the third year, I brought the education program, and that really does benefit every single family here. CR: Can you speak to the traditional art forms? QY: There are three components: the art of song, paper-cutting, and folk arts and crafts. And certainly, we have the dragon and lion dance. The latter is actually a little different from the lion dance in other regions: our lions are made from linen and not the usual paper, because Xucun is known for its linen production. That is a big part of our cultural legacy. CR: Many Chinese artists choose to live in big cities, are they also interested in coming to the village? QY: Yes. But they do have the chance, they just don't want to. They might come to village just to sketch, which is not useful. CR: Are there a lot of tourists? QY: There are few, due to the inconvenience of transportation. This village would have been destroyed if there had been a flood of tourists. CR: Are these villagers still working as farmers? QY: The time between frosts makes for a very short agricultural cycle, which in turn results low crop yields. Most young people go find work in the cities. The population here has decreased and only children or the elderly remain. But still, Xucun is pretty lively compared to other villages where you don’t see anyone on the streets. 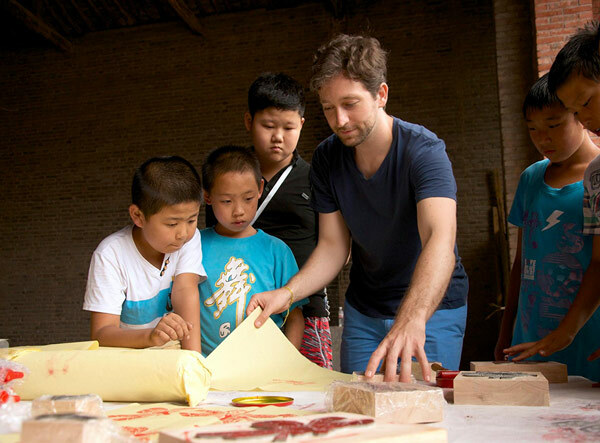 One of the reasons why I chose to take on the Xucun village as an art project is because I want to preserve the traditional aspects of the village and protect it from money-making schemes by the local government, who would probably prefer to just build a tourist center. 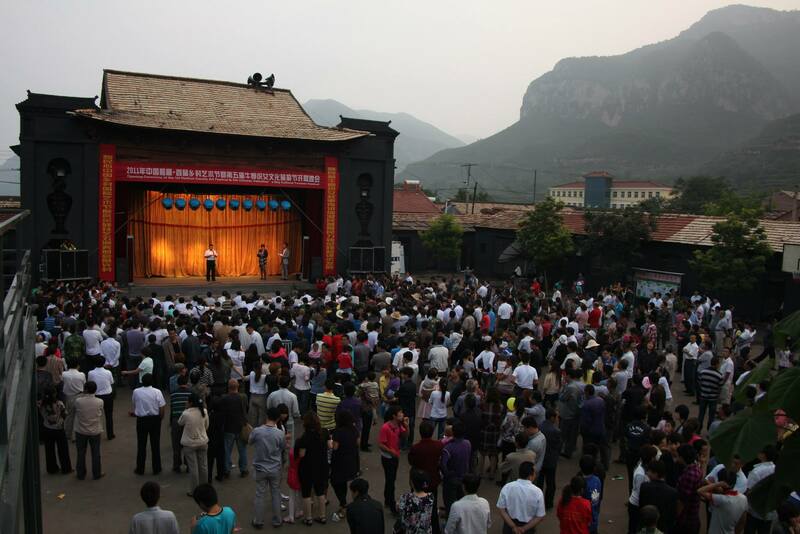 CR: Do the residents of Xucun ever have the urge to learn about their ancestors’ history? QY: After so many revolutions, the Chinese consider this place as a shadow of the feudal era. My goal is to rebuild the custom of village and make them curious again. CR: Right now we a lot of artists like Ou Ning trying to start projects to restart the village. Does it seem like there are a lot of efforts like yours in this area? QY: Ah yes, he’s the director of Bishan Project. There’s an exhibition in Beijing on April 30th about Xucun and Bishan. There are a few similar projects but in my opinion they are less substantial because they’re constructed as experiments or just out of curiosity. It takes several years and more effort than just holding a small event and documenting that, before you can see an outcome. CR: Sometimes these kinds of events can have a hard time attracting an audience. QY: It’s not just that they can’t attract people, the local villagers also have a hard time accepting that the event is happening. The organizers’ goals are so removed from the local people’s lives; they tend not to support you if you can’t promise them any benefits. A packed audience watches the opening of the festival. CR: Do you consider this a long-term project? And where does the funding come from? QY: I would love this to be a long-term project. But sadly, there is no systematic guarantee that the specific project you’re working on can continue. It’s contingent on a few things; one of them being how open-minded the local governors are. If not, then even small changes to the project planning can put the whole thing in jeopardy. But I believe the project will be influential if it’s beneficial to the village, which in turn, makes the project more substantial for the village. I saw an interview online with one of Xucun’s governors who said he was excited about our mission and that they like it because it’s unique. But it takes a lot of time and monetary resources to bring the project to fruition -- an amount of money that’s definitely not in Xucun’s budget, and that’s why my involvement is really vital. Funding is mostly from corporations in the mining industry. So, theoretically they also need to participate in corporate responsibility and contribute back to the village. CR: Do you have hold any events other than the residency? QY: We have other programs, including keynotes and seminars for critics, a screening of Asian documentaries, village photography exhibitions, and folk song concerts. It’s like a carnival! CR: What are some requirements for artists to get a residency in Xucun? QY: It has the reputation of being competitive because it’s so interesting. Some artists will need to apply for funding on their own, or pay for the residency out of pocket. Apart from that, I’d like the work done here to be . In the beginning, we had required artists to make paintings so that the villagers could understand what we were doing. Unfortunately other art forms are not considered as “serious” here. I had tried explaining contemporary art to someone once and they had replied that contemporary must be “a naked body running on the street.” It’s a process, and we need to patient. Interview by Kira Simon-Kennedy on April 9 2015 in Huairou, Beijng, and translated by Sam Gong for China Residencies.